The pattern is, ÷ 2 + 1, ÷ 3 + 3, ÷ 4 + 5, ÷ 5 + 7,.. The following pie chart shows percentage distribution of total number of cars sold in five different cities and the table shows the ratio of two different model cars sold in those cities. 6. Find the total number of M2 cars sold in all the five cities together? 7. Total number of M1 cars sold in City P, R and T together is approximately what percentage more/less than the total number of M2 cars sold in City Q, S and T together? 8. Which city has sold highest number of M1 cars? So, City S sold highest number of M1 cars. 9. Find the difference between the total number of M2 cars sold in City P and Q together to that of total number of M1 cars sold in City S and T together? 10. Find the ratio between the total number of cars sold in City P, R and T together to that of total number of cars sold in City Q, R and S together? 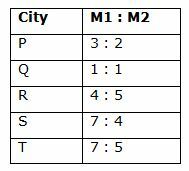 6) Find the total number of M2 cars sold in all the five cities together? 7) Total number of M1 cars sold in City P, R and T together is approximately what percentage more/less than the total number of M2 cars sold in City Q, S and T together? 8) Which city has sold highest number of M1 cars? 9) Find the difference between the total number of M2 cars sold in City P and Q together to that of total number of M1 cars sold in City S and T together? 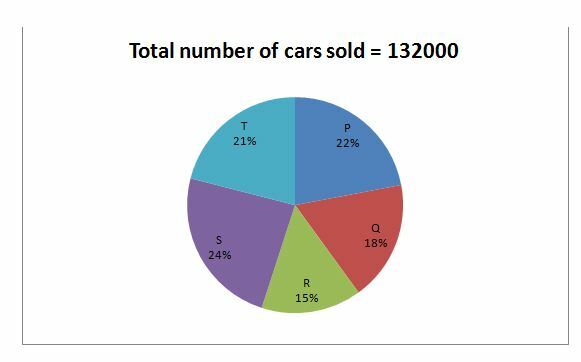 10) Find the ratio between the total number of cars sold in City P, R and T together to that of total number of cars sold in City Q, R and S together?